Fathom Events and GKIDS are excited to bring Castle in the Sky to select movie theatres nationwide for a special three-day event on November 18, 19 and 20 as part of Studio Ghibli Fest 2018. 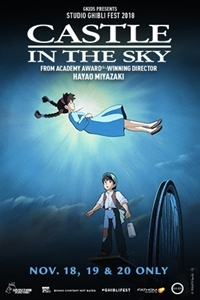 Castle in the Sky is a timeless story of courage and friendship, with stunning animation from acclaimed Academy Award®-winning director Hayao Miyazaki. The English-dubbed cast includes the vocal talents of Anna Paquin, James Van Der Beek, Cloris Leachman, Mark Hamill, Mandy Patinkin, and more!